Removing carpet may not be the most fun job in the world for a Sunday which is probably why so many people pay our team to do it for them! We want to make sure we can always offer you the best service when it comes to carpet removal so we’ve actually created a quick walkthrough guide. At City Junk we know that when you phone us, all you want is a big helping hand that you can always depend on. Every job is different, every home is different, and everything needs to be planned if it’s going to get done the easy way. That’s why when you call us we take care of everything quickly and efficiently, and we’ll even pass those savings onto you in the form of a super affordable carpet removal cost. There’s a reason we’re known as the easy carpet disposal UK team! Making disposal affordable for one and all! Removing old carpet doesn’t have to be a disposal nightmare, and with us making a beeline to your home it won’t be. We’re the experts at finishing the job in any home, premises, or facility, and we’re proud to keep on doing so! We remove anything from your floor that’s to be shifted; now we can’t say fairer than that when describing our service can we folks! To make the cost of carpet removal lower than ever before we make every effort to ensure we remove everything in one quick visit. That way there’s no need to rebook our service to get those finishing touches; it’s all taken care of the first time around. 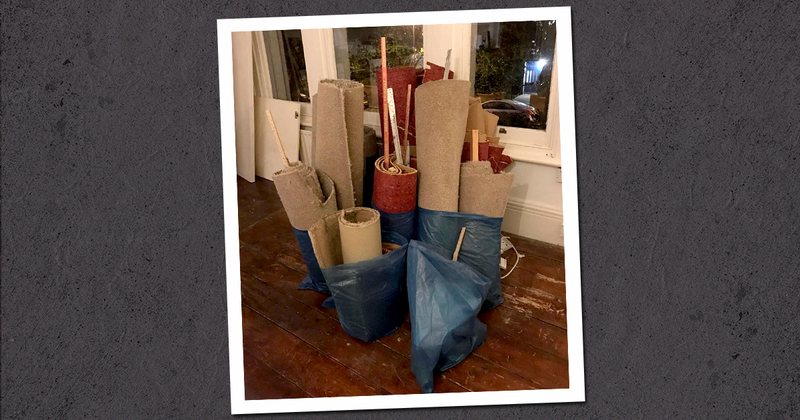 It’s all part of our commitment to become the carpet removal company every single Londoner turns to when they need to make sure they remove everything from their floor in time for the arrival of their new flooring. Need it quick? Why not get in touch with the same-day specialists? We can get rid of anything you need whenever you need us to, and we can usually complete everything the same day! Perfect if you want to make disposing of carpet the easiest job on your to-do list when you’re having your new flooring installed. And don’t worry about the environment either because we’re the experts when it comes to recycling. That way you can sleep with the peace of mind that only comes from knowing you’re doing everything you can to protect the countryside from fly tippers and the environment from the harm caused by landfill sites. Trust us when we say this: if we can do it, then we’re going to make sure we recycle it. For us recycling is more than just something we say we’ll do. It’s something that we’re deeply passionate about that we see as a core part of any complete job. Usually we get rid of every single scrap the green way, and the only times we don’t are when there’s no one who can accept it. Now that’s what we call the green approach to installing new flooring in your home! Usually when you phone up a company and ask for help with carpet waste disposal they’ll tell you at least one of two pieces of bad news. Either they have a very long waiting list in your postcode, all they’ll present you with such an over the odds carpet disposal cost that it doesn’t matter how quick they are you just can’t afford them. No one wants to hear bad news which is why we’re committed to changing the game when it comes to old carpet disposal. Our team are the experts when it comes to old carpet removal because we’ve been in the game a long time. This means that not only do we know what works when it comes time to shift some awkward loads, we also know what doesn’t work! Perfect for ensuring that whatever you need to get done we can take care of it for you. The only question for you now is what do you need to do to make it all happen? If you have the space then feel free to remove any furniture or items from your carpet if it’s still fitted. We’re more than happy to do all the moving for you, but the less we have to do the less we’ll charge. Now we can’t say fairer than that can we folks? If you don’t have room or the means to remove your old carpet then that’s not an issue because we can do that when we arrive. We’ve done it a thousand times and know exactly what we’re doing so you’re all set in that respect. What could be useful is if you could give it a quick vacuum. That’ll reduce any dust that goes up into the air once we start the removal. We’re always thankful for any space you’re able to make along the route the carpet will take out of your property. It’s the little things that can make all the difference. If you have a bike in the hallway or a dog that likes to roam free then popping them in a different room whilst we get to work is always appreciated. Let’s get you booked in! Our carpet removal service is available for bookings 24/7 unlike any of the other carpet removal companies in London. That’s because we care about our customers and want to work the hours that tie in with your working day. Others may only offer 9 - 5 collections, but we know that you don’t want to have to take a day off work for something like this. To get booked in all you have to do is phone our team and they’ll ask all the right questions in just a couple of minutes. They’ll guide you through our simple carpet removal prices so that you understand how we create a cost for removing carpet. That way you’ll have everything you need to know to make an informed decision and get the ball rolling. Perfect for being able to power ahead and get your new flooring laid in no time at all without the headaches. Contact us for a free, no obligation quote! Get a response within 10 minutes! Thank you for your application! We will contact you shortly.